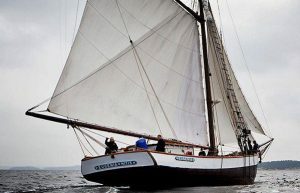 The sailing Yacht Eugenia is a replica of the last sailing yacht in cargo traffic in Finland. Built 1879 she sailed until 1951 without an auxiliary engine. You can charter s/y Eugenia for a day or more and spend a wonderful time at sea under sail. Our home port at Kalkholmen, Kimitoön but departures are possible from Kalkholmen, Dalsbruk or Kasnäs. We plan your sailing schedule according to your wishes and the crew will do their utmost to make your sailing trip unforgettable. The vessel can take 25 passengers. The passanger cabin below deck has 13-15 seats and there are 9 sleeping berths on board. The Eugenia has a small galley with a stove and a refrigerator. The passenger space under deck is modest, but cozy. Around the long table there is space for 12-13 persons. Toilet and running water also on board. At the moment, Eugenia is open for group bookings only. We will also be arranging public sailing departures during the summer of 2018, details will be available later during the spring.